This new project is going to be another challenging adventure. I don't know why, but the voices I hear in my head are never suggesting something easy and fast to make...ah! (All the dark blu words are links, please right click to open in a new window). Frany sent me 3 beautiful flowers and a beaded bead, but I've been having a hard time trying to find a way to use them all in a single piece, so I decided to use the light sage green flower and the matching beaded bead and keep the 2 black/red/orange ones for future projects. There are three species of Silversword, found on Mauna Kea, Mauna Loa (on the Big Island of Hawaii) and Haleakala on Maui. The beaded bead could be transformed into a Protea, another plant which grows in Hawaii, but can be found also in other parts of the world. I don't know how it's going to work out and I might change something along the way, but the idea is to construct a base that gives the idea of an old lava flow and then insert the flowers and some ferns among the lava rocks...something like This. I'm going to bezel the lava rock beads and then work the connections in free-form peyote and probably some brick stitch. 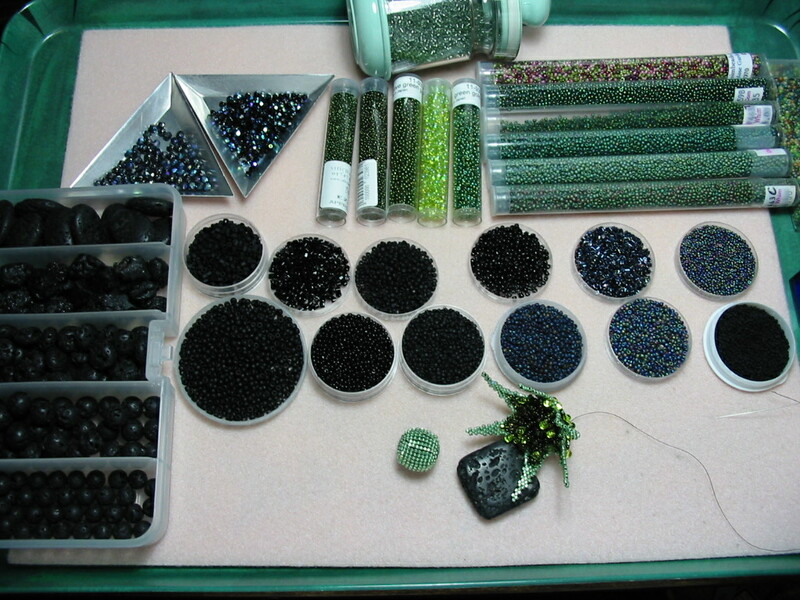 In this photo you can see the beads I chose for this new necklace. I might not use them all, or add some, but basically this is the palette I'm going to use. The blacks are in different sizes, shapes and finishes. je suivrais pas à pas ce que tu vas faire avec mes fleurs ma Saby!!!! J'espère qu'il va venir bien et que tu ne va pas être déçu.